Pesticides have been with us throughout civilization. “The history of man is the record of a hungry creature in search of food,”¹ and when we found food, and eventually cultivated it, we wanted to minimize the amount that would be lost to all manner of hungry pests. Examples of early pesticides include: use of sulfur by ancient Sumerians to control mites and insects around 2500 BC; use of salt and ash by Biblical armies on fields of the conquered to make their land unproductive, indicating that use of broad-spectrum herbicides goes back to around 1200 BC; and Chinese use of arsenic around AD 900 to control garden insects. Ritual, religion and magic apparently were also engaged. Estimated losses from all pests without pesticide use in the U.S. range from 24 to 79 percent, while global crop losses from pests have been estimated at about 35 percent. Pest control is thus essential for crop productivity, and it has evolved substantially over the past eight decades. For those interested in such history and its details, two comprehensive reports provide a wealth of data documenting the changes and progress in pesticide characteristics. The first, Pesticide Usage in the United States: Trends During the 20th Century, covers the period from 1930 through 1997. 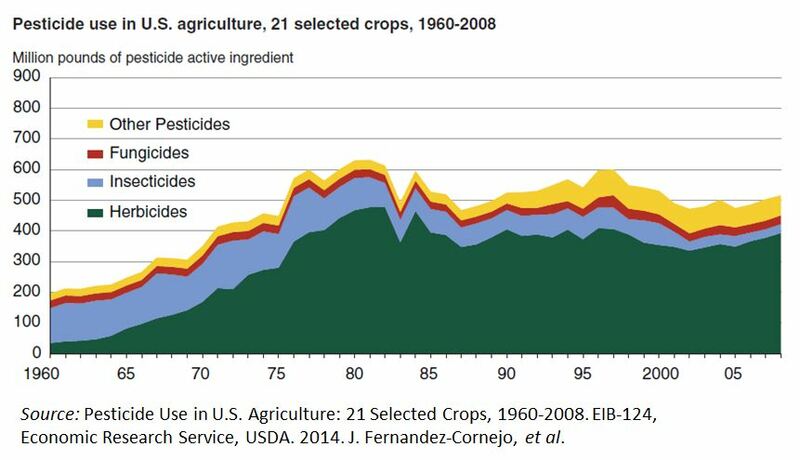 The second, Pesticide Use in U.S. Agriculture: 21 Selected Crops, 1960-2008 includes data from the first 13 years of genetically engineered crops (since 1996). Science reporter Jan TenBruggencate has provided an excellent summary of the latter, and below are some highlights from the former showing how far we have come. Chemicals began to be widely accepted as an option for controlling pests during the late 1800’s. Arsenic-based insecticides (particularly calcium and lead arsenates) were already in common use by 1930 with more than 150 million pounds used per year, and were the leading chemical family by far. Even recommendations to home gardeners in Hawaii in 1943 included use of calcium arsenate, lead arsenate and ‘Paris green’ (a copper arsenate compound) for insect control on some vegetables. The cautionary statement “poisonous to man” accompanied the directions for using arsenical insecticides, and this inherent quality along with the emergence of synthetic organic4 pesticides lead to their eventual disappearance from the market. The new group of insecticides that replaced arsenicals included DDT and other chlorinated hydrocarbons. DDT was toxic to insects with rapid effect, had little or no mammalian or plant toxicity, no irritant effect, a wide range of action, prolonged residual toxicity to insects, and was relatively inexpensive (5). Replacing earlier insecticides (e.g. nicotine and arsenicals) that were less effective and more poisonous to people was an improvement, but the chlorinated hydrocarbons (especially DDT) persisted too long in the environment, with half-lives for bio-degradation in soil measured in the hundreds to thousands of days (6, 7). Eventually, DDT was over utilized, leading to resistance among many targeted insects, and was found to accumulate at progressively higher concentrations in the food chain. These environmental problems lead the newly created EPA to ban DDT in late 1972, followed eventually by most of the other chlorinated hydrocarbons used in agriculture. With emphasis on products that degraded more rapidly in the environment, organophosphate and carbamate insecticides replaced the chlorinated hydrocarbons, and as of 2010 accounted for some 88% of insecticide used on our major crops. However, insecticide use in total has declined significantly over the past 50 years, with much of the decline in insecticide quantity after 1976 due to compounds with reduced per-acre application rates. After 1996, adoption of BT corn and cotton, which produce a protein toxic to some insect species but with very low acute toxicity to humans, also reduced the use of synthetic insecticides. Relatively small amounts of inorganic compounds (e.g., sodium azide and sodium arsenite) were in use prior to 1960. Synthetic organic herbicides, starting with 2,4-D, revolutionized weed control in agriculture. Farmers now had a selective herbicide for broad leaf weeds which had little if any effect on grasses like corn, and acreage treated with herbicides increased rapidly after 1960. With the introduction of genetically engineered crops (GE) in 1996, herbicide tolerant corn, cotton and soybean varieties were widely adopted by farmers. These varieties were tolerant to glyphosate, giving farmers more flexibility in the timing of applications and worked well with minimum tillage systems. By 2010 glyphosate accounted for 56% of all herbicide usage in U.S. agriculture, followed by the amides at 17% and triazines at 16%. Glyphosate also replaced several herbicides used prior to the adoption of herbicide tolerant GE crops. 1) The chronic toxicity index serves as an environmental-risk indicator for humans from drinking water, and has dropped dramatically over 40 years. 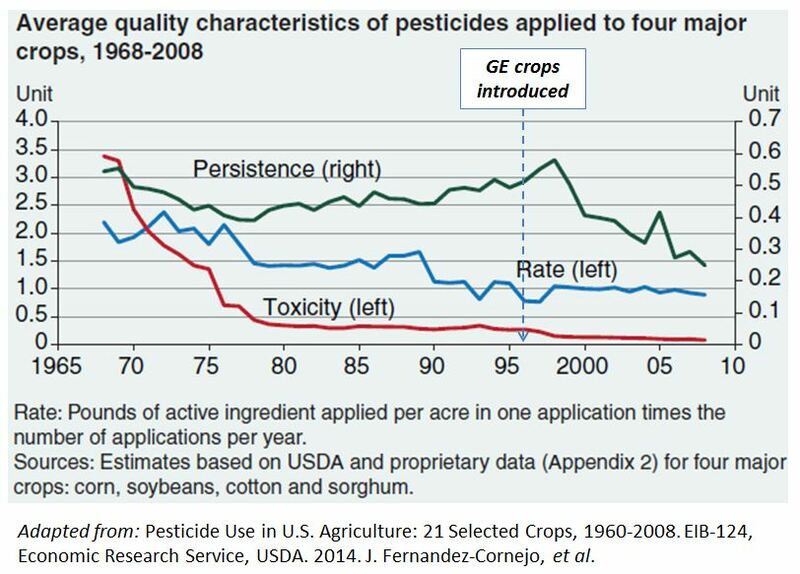 While almost all of the reduction in toxicity occurred prior to 1996 from the more toxic pesticides being banned or voluntarily discontinued, use of GE cotton varieties also contributed to the recent reduction in average pesticide toxicity. 2) The average application rate per crop year has gradually declined by over half, due in part to the use of improved (more potent) pesticides and GE seed. Lower rates of application also reduce the environmental risks of pesticides moving off site including into water sources. 3) In 1968 slightly over 50% of pesticides used on these major crops had half-lives over 60 days, which declined below 30% by 2008. 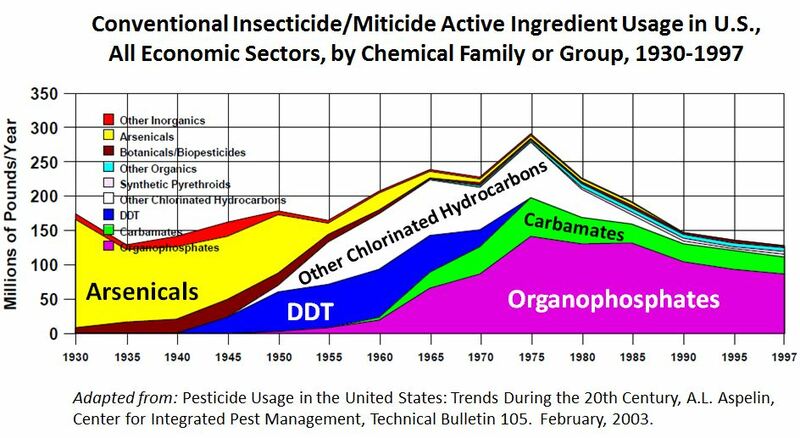 The share of pesticides with a half-life of more than 60 days defines the persistence indicator, which fell after the bans of DDT and aldrin, gradually increased and then continued in a marked decline with the rapid increase in glyphosate use with adoption of herbicide tolerant GE crops. As with lower application rates, use of pesticides with lower persistence like glyphosate is less risky for the environment. The evidence from these comprehensive databases on the trends in the quantity and quality characteristics of agricultural pesticides over the last 80 years is fairly clear. Pesticides used on our major crops have become much less toxic to humans, used at lower application rates, and their persistence in the environment is less. Also, comparison with US population data shows that per capita pesticide use on major crops in 2010 had declined 28% from its 1982 peak. These trends are moving the in right direction, and are a result of combined efforts by science, industry, regulatory agencies responsible for ensuring public and environmental safety, and of course farmers. This is the type of evidence-based information that should be informing discussions by the public and policy makers on the merits of pesticides and GE crops. Those who oppose them might even become more informed and find out how much better things have actually become. 1) H. W. Van Loon. 1921. The Story of Mankind. Cosimo Classics. 4) As in organic chemistry, not as in ‘organic’ agriculture. 5) L.T. Evans. 1998. Feeding the Ten Billion: Plants and Population Growth. Cambridge University Press.